Studies have shown that tin-deficient diets resulted in poor growth, hearing loss, and bilateral (male pattern) hair loss. 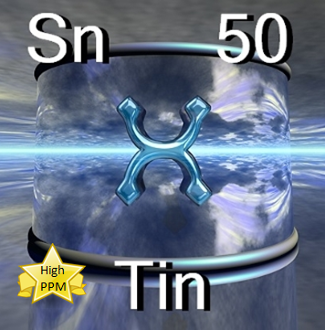 Tin is associated with Iodine the same way as calcium is associated with magnesium. Tin supports the adrenal glands, and iodine supports the thyroid gland, with both subsequently affecting cardiac output: Tin + adrenals control the left side, and iodine + thyroid control the right side. In addition to low Vitamin C and/or Vitamin B1, low tin is a common nutritional cause of low adrenals, which can lead to left-sided cardiac insufficiency. While fatigue or depression may be experiencedwith cardiac insufficiency of either side, breathing difficulties or asthma are more common with left-sided cardiac insufficiency, and swelling of hands and feet is more common with right-sided cardiac insufficiency, regardless of the cause. Comparing thousands of patient records showed that better than 90% of patients tested exhibited moderately low, to very low levels of Tin when referenced to the status of all other essential trace minerals, making tin the most deficient element compared to any other trace mineral measured. Positive health effects were numerous and included improvements with fatigue, some forms of depression, and a general increase in energy, well-being, and mood. There were also benefits with certain types of headaches, insomnia, asthma, or improvements with digestion, skin, or various aches and pains. Tin is not a panacea for depression - it will not work when other chemical imbalances are involved, but it can be the missing link when most other attempts to resolve depression have failed; essentially involving low, or malfunctioning adrenals. For the same reason, some cases of asthma - particularly when related to low adrenals and subsequent left-sided cardiac insufficiency - respond to tin as well. In some countries Tin has been utilized as a remedy for intestinal parasites. Tin is an amazing substance that is a reminder that metals are made of crystals and that they are only experienced by us as "metallic" and "hard" because the circumstances of our world hold it in that state. If you can clear your mind of the general ideas about tin, you will find it a very helpful, compliant and co-operative element for symbol making especially. Ruled by Jupiter. Sagittarius and Pisces are its astrological houses and it corresponds to the letter O and carnelian. Use for meditation and relaxation, honor, wealth, wisdom. The largest of the planets in the solar system, Jupiter, is associated with the chief God of the Roman Pantheon - Jupiter. The qualities of Jupiter are abundance, prosperity, growth and success. It is also the planet of healing, regeneration and rejuvenation. Use Tin in rituals/spells promoting abundance, prosperity, success in business and in legal matters, stimulation, attracting what you desire, energy, healing, regeneration and rejuvenation.